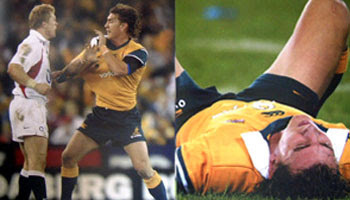 In 2003 Josh Lewsey showed that he's not to be messed with as he gave Wallaby Mat Rogers the treatment he probably deserved after an earlier altercation in the match. The Aussie was having a go at him the whole day, and when Lewsey finally got payback, it was well worth it, and spectacular to watch. Rogers recently (edit: Oct 2008) spoke to the Sun newspaper about how that hit was the hardest hit he's ever taken, making him feel like he'd been run over. The broken ribs he was left with were testament to the crunching power of that tackle. Punches had already been exchanged before Rogers was hit with the now famous sledge-hammer tackle during the Aussie’s 2003 defeat Down Under. Rogers, 32, said: "I’ve taken a fair few hits in my time. But that one was like getting run over. "I think that hit will take the crown as the biggest ever. I just remember lying there writhing in pain, unable to breathe. "It left me with broken ribs and for months afterwards I couldn’t go surfing because my rib stuck out on the board! "I was a young, frustrated fella back then and I guess Josh taught me a hard lesson." i was lucky enough to be at this game and ive never seen the aussies so quiet after this hit. awesome!! Matt Rogers cant surf properly anymore after that tackle because of a lump that came up in his rib cage.. apparently... love it! Yep - and the day after England won the world cup there was a photo of Josh Lewsey on a surf board on the front cover of some of the English newspapers - nice. WOOOOOO HOOOOOOO LEWSEY ROCKS. Hes deffinatly my first chois of fullback. he hits the line at pure speed and full power. LEWSEY ROCKS! But you have to love the aussies! Great sports and hilarious commentating! ha ha ha...Mat Rogers...what an cnut! I love the pictures above the video...you can almost see Rogers saying "not the face, not the face"..! I can watch that for hours on end. it isnt the year before the world cup, its the same year as we beat new zealand and australia in their back yards, i wish people would take note of there rugby!!!!!!!!!!!!!!! Very funny, Lewsey = Welsh, Volcano = Fijian! England are looking like they're on the way down!! I love the commentary on that..
Lewsey's first name is Owen not Josh. He is fiercely English but definitely has a touch of the taffs about him. Class act.